Today's dish is not considered part of Arabic or Middle Eastern food! It is originally a Russian dish that has nowadays gained international status: Beef Stroganoff. Beef Stroganoff is one of those very old and traditional recipes that date-back centuries. The first known recipe for Beef Stroganoff appeared in a Russian cookbook in 1861. That version didn't have onions, mushroom, peppers or tomatoes. Beef Stroganoff had such an appeal, and became quite popular. It became so popular that many people developed the basic Beef Stroganoff recipe further and in modern days many, many versions exist. Some Beef Stroganoff recipes include the traditional sour cream, while others use whipping cream. Some Beef Stroganoff recipes include tomatoes, while others don't. There are so many versions of Beef Stroganoff that if you do a search of "Stroganoff Recipe", you will even come up with a vegetarian alternative! At our home, we have our own version. I am not sure what Elena Molokhovet (the writer of that first published recipe) would think of it, but I do know that it is a very easy recipe to prepare and the resulting dish is very delicious. We enjoy this version of Beef Stroganoff a lot, hope you will too. Wash beef and let drain from all water. If you are short on time, you can dry the beef with kitchen towels. 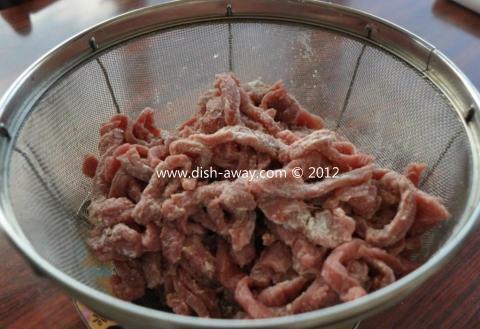 Mix the beef and flour well until all beef is coated. if needed, add another 1/2 spoon flour. Heat oil in pan, add the beef and toss until it is light brown. Add the onions and garlic, turn for one minute. Add the peppers, mushrooms, salt and spices. Mix over heat for 5 minutes. Add water until it covers the ingredients. Mix in the steak sauce. When stock boils, reduce heat and let it cook for about 1 1/2 hours. Mix intermittently. 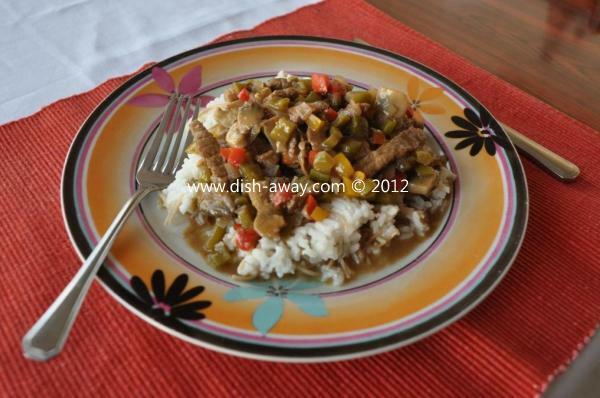 Hope you enjoyed today's easy recipe: Beef Stroganoff. Bon appetite. Do you have your own version of Beef Stroganoff? Hi Seta. Would I ruin the taste of this recipe if I omit the mushrooms? Unfortunately, I cannot use mushrooms in my cooking (although I love it a lot) b cos my husband is allergic to it..So do u think I can replace it with something else?? Thanks Seta! I will do that and will keep you posted! Salwa, hope the dish turned out to your satisfaction?! ?